I just read a flurry of emails on a frugal website about the rising cost of vanilla and how people are working around that while continuing to live their frugal lives. Not one of the letters asked these logical questions. Why has the price of vanilla risen so steeply? What is happening to the people who grow and process it? Often frugal “first world” people can be pretty obtuse about the “cost” behind a cost. If something cost me $3 or $18, I need to pay attention- but my life will not succeed or implode because of the variance in those costs. So I googled “why is vanilla so expensive?” and I am going to tell you what I learned. Most of the world’s best vanilla was and still is grown in Madagascar; a large island nation off the east coast of Africa. 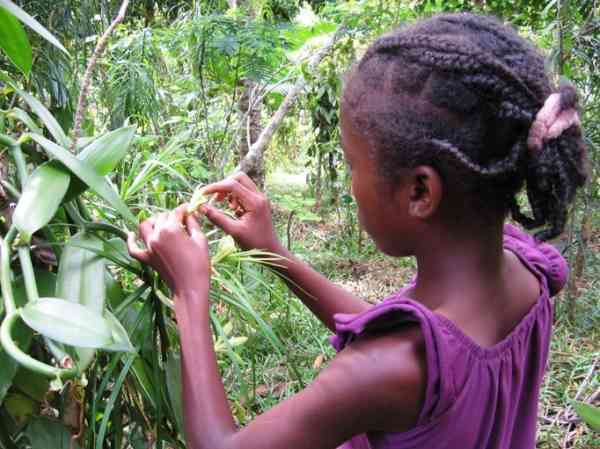 In the past dozen years Madagascar has suffered some horrendously giant typhoons that have wiped out 1/3 - ½ of the vanilla crop in a single storm. From replanting to first crop takes four years. Vanilla is now being grown in many other places, but Madagascar still rules much of the trade. In the past few years the west (US and Europe) have become more concerned with “natural products” which has increased the demand for genuine vanilla. Most of the current supply crunch derives from people like you and me who think we can tell the difference between those two products in the baked goods we purchase. Vanilla is an orchid. The orchid is only open and receptive to pollination one day out of the year. A particular bee has to do the job, so the karma has to align for the bee and the day! If there aren’t enough bees, humans must pollinate the flower. Thus the opening photo of a child hand-pollinating orchids. Now the plant has to grow pods which takes 3-4 months. Premium vanilla comes from pods that have ripened luxuriously on the vine - but in the past years as the price of vanilla pods have skyrocketed, thieves steal the pods in the night. Farmers now form posses to patrol their farms all night, every night, for months. This is dangerous and exhausting. Many growers are tempted by offers from unscrupulous buyers to sell their pods before they’ve fully ripened. At this point these middle men vacuum pack the green pods. They will then unseal the pods months later to process and sell at that time. Speculation drives up prices, plus vacuum sealed early-picked pods do not have the best deep vanilla flavor. It is illegal to do this, which means the conditions in which workers process this “late” vanilla are unsupervised and exploitive. Vanilla is the second most labor-intensive spice (the first is saffron). Pods must be picked by hand, peeled, dried, and handled gingerly. This is often done by women who are paid very little. There is much more to know but be aware when you buy vanilla and it is pricey, it is currently squeezing small farmers out of business. The massive amounts of money to be made by those who steal and deal is putting small farmers in harm’s way. Farmers and their families are living more on the edge than ever, and the rich are getting richer. Often the cut-throat middle man are from outside Madagascar, so the incredible wealth does not even stay in the nation where it grows. "Vanilla Queen" is an interesting well-designed website from a woman who has been an expert in things vanilla since 1985. She cares about the product and the farmers. You can buy real vanilla that was raised in ways that pay the farmers fairly – at her website. It’s super expensive, which is exactly what it needs to be if you want to respect the men and women who grow and process it. I found her website by googling; I don't know any more about her than I learned this afternoon. I’ve read some who say they are substituting brandy or Amaretto for vanilla. If you CAN afford the real thing, buy it from a source you trust. Consider that you are helping to make one part of the world slightly safer by ensuring your payment is getting to the people who raised and made it. It’s little choices like this that provide a moment for us to grow as humans who care about others – and for there to be one more piece of peace somewhere. The vanilla orchid needs to be about 100' long before it will even produce flowers. They grow up trees so if the tree is knocked or cut down the orchid is destroyed. To pollinate the flower's they need to climb the trees (also dangerous) a friend once gave me some pieces from a botanical garden from some trimmings. I managed to grow a piece in my upstairs to about 60' by running it from one end of the house to the other and back again before it finally died. Wow. Which explains the incredible damage from typhoons. There are pix at Google Image (type in vanilla farms) that show acres of greenhouses with vines growing up and down poles, along wires - that must be how they get the hundred feet of vines. There is SO much $ in vanilla right now for those who can get their hands on it to barter it. There are millionaires who are corrupt and dangerous, and the small farmer guy whose family has been doing this for generations - is at risk for loss and violence. To just make it even more complicated, others are cutting rosewood out of the middle of forests - and hiding that strictly illegal theft under the umbrella of "vanilla farming". Aren't we just so spoiled that we feel indignation when we are asked to pay a fair price for some thing so precious! Humans can be so greedy and it's disheartening. Thank you for the story. It makes me appreciate my vanilla and the farmers so much more!